I started this post awhile back, but never finished it. However, as I continue to explore the intersection of art, design and technology, I was reminded of how rapidly human computer interaction technologies are changing and despite the age of these videos, thought they would still be a worthwhile starting point for reflection and conversation. The first being the Project Natal Connect a Million Minds Case Study http://www.youtube.com/watch?v=C6EcgEN2kYA involving the Microsoft Xbox and various levels of motion and speech based recognition and control. The second level of innovation is in the area of spatial gesture based operating environments conceptualized by John Underkoffler and being developed by the company he founded Oblong Industries. The technology called g-speak provides for a number of advanced device integration and control options. This technology was demonstrated at the February 2010 TED conference. Studying these technologies and thinking about the continued evolution of human computer interaction, haptics and other areas of research, I am reminded of a musical device I had the chance to experiment with a number of years ago. The Theremin invented by Professor Leon Theremin and patented in 1928, it provided for motion based control of sound frequency and amplitude. Looking forward, it would not be much of a stretch to combine these gesture based controls with a virtual Theremin or possibly provide hidden doorways within a game that can only be unlocked when a particular sound oscillation and level is found. I was recently learning about telepresence bridging capabilities on Internet2 and the National Lambda Rail and began to think about how far we have come with videoconferencing over the past 15 years. The quality of high definition videoconferencing and the ease of use of full telepresence systems like those offered by Cisco is a considerable communication achievement. Not unlike the communication screen on the Star Trek bridge or those used in other sci-fi movies and television series. A related topic of discussion was the blue screen people on content feature of Polycom videoconferencing systems where you can use blue screen technology to insert content behind your live video image. With this I began to think about the next big thing and what another 10 to15 years will bring us for video communications. Recently 3D viewing for television and video has been a hot topic in broadcasting and film. The PACE HD 3D Mobile production trucks and technology is being used in movies, broadcasting, music videos and more to produce real-time 3D video. The HDLogix technology has also been tested with the Clique Video Phone as a potentially viable 3D communications solution. In terms of display technologies, Barco has a variety of immersive stereoscopic displays that are currently being used for entertainment, visualiztion and research. Barco and Tandberg have already worked together on Telepresence display solutions. With the pending acquisition of Tandberg by Cisco, I see this partnership continuing into the 3D HD telepresence realm. Reflecting how this technology can be applied to traditional 2D video images to create 3D video in anaglyph, stereoscopic, and autostereoscopic views, or incorporated into specialized cameras to create 3D images from the start, I think we are quickly moving in this direction. Given the computational power of computer chips and graphics cards, combined with the increasing availability of network bandwidth, how soon might we see wide adoption of 3D videoconferencing? My guess is it will be cost effective and broadly adopted in 7-10 years. I recently read two stories regarding incredible displays of human strength, willpower and endurance and found myself compelled to share them. As someone who has participated in relatively short hikes and frequently runs and bikes what I would consider a good number of miles on a regular basis, I find these accomplishments incredible. With the directory of educational videos at http://www.watchknow.org/ that was launched by Wikipedia co-founder Dr. Larry Sanger in October 2009, I am reminded of the concept of learning objects that has been the topic of repositories such as MERLOT (the Multimedia Educational Resource for Learning and Online Teaching) for many years. While MERLOT is well known in Higher Education, I have found that it is not readily utilized in K-12 education, despite is value for accelerated learners and advanced placement course materials. I suspect that this will change as online learning continues to develop and grow throughout K-12 and individualized instruction empowers students to move beyond their primary curriculum. With the wealth of information that is now available through these and other organized sources such as iTunes University, Youtube, National Geographic, Discovery Learning, the Library Video Company, United Streaming, Google Earth, and other content providers. The ability to have this information organized and available to learners on-demand is beyond what can be found in any individual printed textbook, college or school library. This brings me to one last thought, the future of textbooks and learning. Having experimented with content available through the Apple IPod Touch, Tablet PCs, and other portable devices such as the iPad, and content made available by publishers as supplemental resources for textbooks, I believe that we are on the verge of harnessing the power of electronic content for learning. A dynamic electronic learning resource that can be organized and sequenced according to a college, school or individual course curriculum with embedded remediation, supplemental learning materials and potentially multiple languages could help to harness the ever growing body of historical, literary, and scientific knowledge our global communities are creating. Given this, learners will need a sound grasp of the fundamentals, combined with a core body of advanced subject knowledge and the ability to research a topic, synthesize the information and learn on their own. Individuals with this foundation will be in a position to learn and advance beyond any current limitations to create, invent and discover new knowledge breakthroughs which can be fed back into the global repository for the advancement of humankind. I was recently reviewing new options in Picasa and Google Earth. 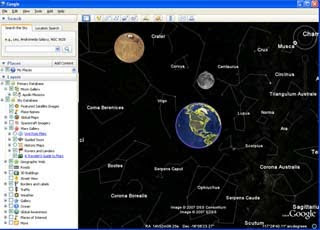 The Explore Earth, Sky, Mars, Moon features in Google Earth reminded me of a product integration idea I had a few years ago when Google first introduced http://moon.google.com and http://mars.google.com As an individual with a scientific background and continued interest in interactive media and educational technologies, I think it would be cool to see the Googleverse App, which would basically launch as a planetary model where individuals could explore the entire solar system, turn on and off magnetic field layers, learn about gravitational forces, solar flares from the sun, see passing comets, and follow the various NASA space probe missions such as the Casini and Voyager projects. The earth, sky, moon, mars and other planets could still be selected for view from a menu, but in general you could just zoom out and then click the planet or moon that you want to explore. 3D models of orbiting satellites could be loaded in much the way Sketchup lets users add content and then much the way you can design and build virtual worlds in Second Life, users could colonize planets and explore new worlds. Live videoconferencing could be enabled between users within the virtual worlds, or individuals could continue to learn and interact via their avatars. You could rotate around and between the planets or the rings of Saturn and moons of Jupiter. Users and astronomers worldwide could contribute images captured from telescopes through tagged photos in Picasa. The product could eventually be developed to the point where it could be integrated with 3D imagery and stereoscopic views, much like the current trend in movies. This advanced 3D version of the universe could then be tied into new projection technologies for education, guided tours and shows in iMax theaters, Planetariums and other venues around the world.